Vancouver is a city on the north bank of the Columbia River in the U.S. On the 28th (Mon), admire all the interesting features of Roloff Farms, steep yourself in history at George C. Marshall House, and then get to know the fascinating history of Officers' Row. To find more things to do, photos, traveler tips, and tourist information, you can read our Vancouver trip itinerary maker app . Perth, Australia to Vancouver is an approximately 26-hour flight. The time zone changes from Australian Western Standard Time to Pacific Standard Time, which is usually a -16 hour difference. Traveling from Perth in December, things will get much colder in Vancouver: highs are around 8°C and lows about 1°C. 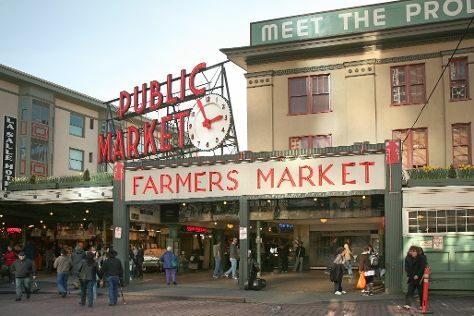 Finish your sightseeing early on the 28th (Mon) so you can drive to Seattle. On the 29th (Tue), take a stroll through Pike Place Market, identify plant and animal life at Washington Park Arboretum, and then stroll the grounds of Bruce Lee Grave Site. To find where to stay, photos, other places to visit, and tourist information, go to the Seattle visit planner. Getting from Vancouver to Seattle by car takes about 3 hours. Other options: take a train; or take a bus. Expect a daytime high around 9°C in December, and nighttime lows around 3°C. Wrap up your sightseeing on the 29th (Tue) to allow time to travel to Grand Canyon National Park. Start off your visit on the 30th (Wed): take in breathtaking views at Yavapai Point, get curious at Yavapai Geology Museum, then take in breathtaking views at Grand Canyon South Rim, then take some stellar pictures from Powell Point, and finally take some stellar pictures from Lookout Studio. Keep things going the next day: stroll through Bright Angel Trail. For where to stay, other places to visit, more things to do, and tourist information, read our Grand Canyon National Park trip planner . Getting from Seattle to Grand Canyon National Park by combination of flight and bus takes about 9.5 hours. Other options: do a combination of flight and shuttle; or drive. Traveling from Seattle to Grand Canyon National Park, you'll lose 1 hour due to the time zone difference. Traveling from Seattle in December, Grand Canyon National Park is much colder at night with lows of -11°C. Wrap up your sightseeing on the 31st (Thu) to allow time to drive to Los Angeles. Start off your visit on the 1st (Fri): look for all kinds of wild species at Kenneth Hahn State Recreation Area, then kick back and relax at Venice Beach and Boardwalk, and then appreciate the extensive heritage of Santa Monica Pier. For photos, ratings, other places to visit, and more tourist information, you can read our Los Angeles trip itinerary website . Getting from Grand Canyon National Park to Los Angeles by car takes about 7.5 hours. Other options: do a combination of bus and flight; or do a combination of shuttle and flight. The time zone difference moving from Mountain Standard Time to Pacific Standard Time is minus 1 hour. In January, Los Angeles is warmer than Grand Canyon National Park - with highs of 24°C and lows of 11°C. Wrap up your sightseeing on the 1st (Fri) to allow time to travel back home.